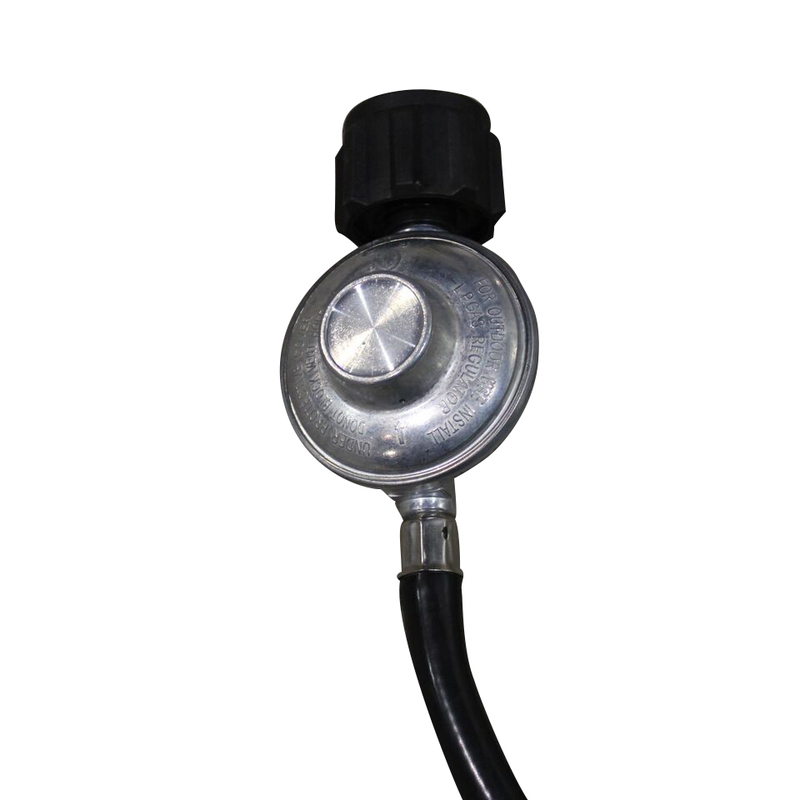 Comes standard with a CSA/UL approved fuel regulator, fuel lines, and flameout sensor. The push-button electric ignition switch means no more fumbling for lighters, strikers or matches. A sealed fuel-efficient 60,000 BTU burner eliminates flame-outs from wind gusts. A heavy-duty molasses valve controls the flow of crack fill to pour pots or banders. The RY10 MK-PRO is a portable crack fill kettle designed to be free standing or optionally bolted to any truck or trailer. Its heavy duty molasses valve allows you to control the flow of material into any pour-pot or bander. Safety, reliability and efficiency combine in this machine to create a contractor’s must-have. What’s more, the advanced kettle design distributes heat more quickly, reducing melting time by almost 35%. 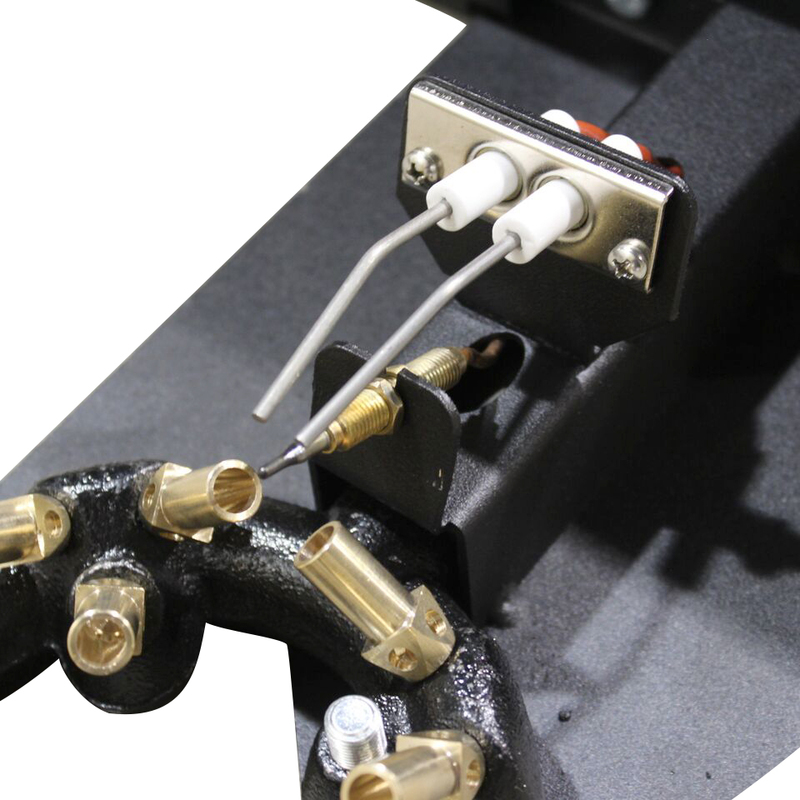 The CSA / UL approved Regulator, Fuel Lines and Flame-out sensor mean you have safe and precise control over fuel going to the burner. Contractors can expect to apply up to 600′ of crack filler per hour or 4,800 feet per day using crack banders or pour pots in combination with this progressive new kettle / burner combination. Fully Equipped with CSA / UL approved Regulator and Fuel Lines provide precise control over fuel flow and kettle temperature. 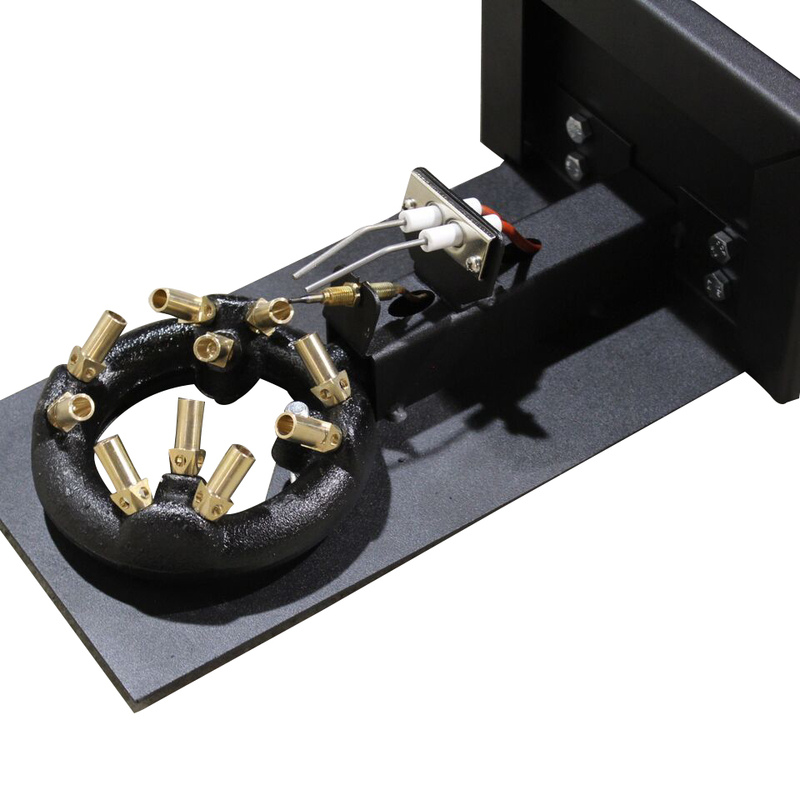 The unique sealed burner is equipped with a CSA / UL approved flameout sensor which detects flameouts commonly caused by wind and prevents fuel from flowing to the burner. No more wasting time searching for a striker, lighter or matches. 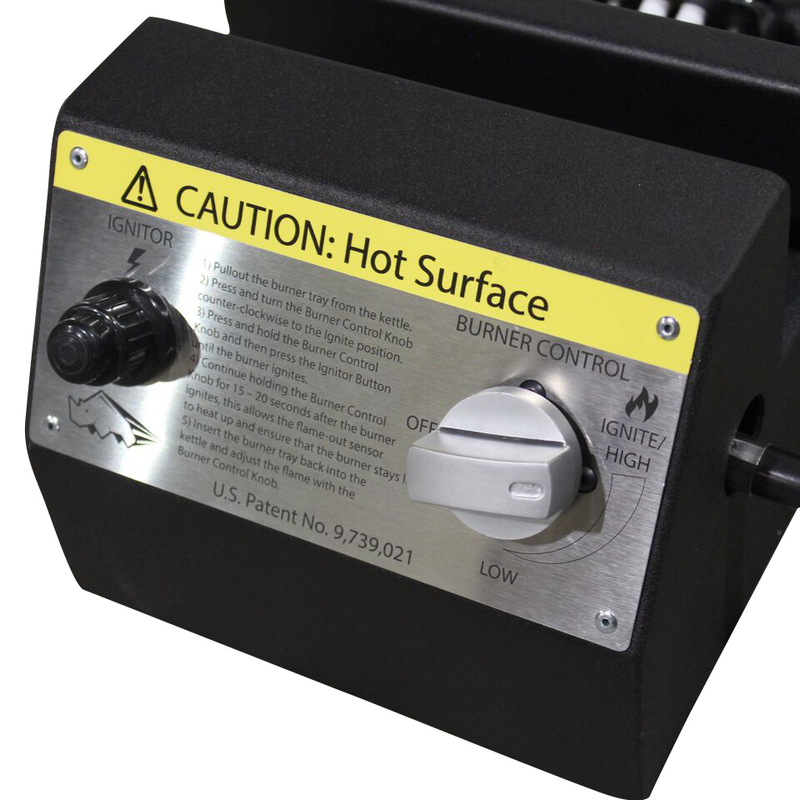 Starting a melter has never been easier with our Push Button Electric Ignition. The sealed gas burner is shielded from the elements and virtually eliminates flameouts by wind, which are common to torch-fired models. The temperature gauge is one of the most vulnerable parts on any crack fill melter. 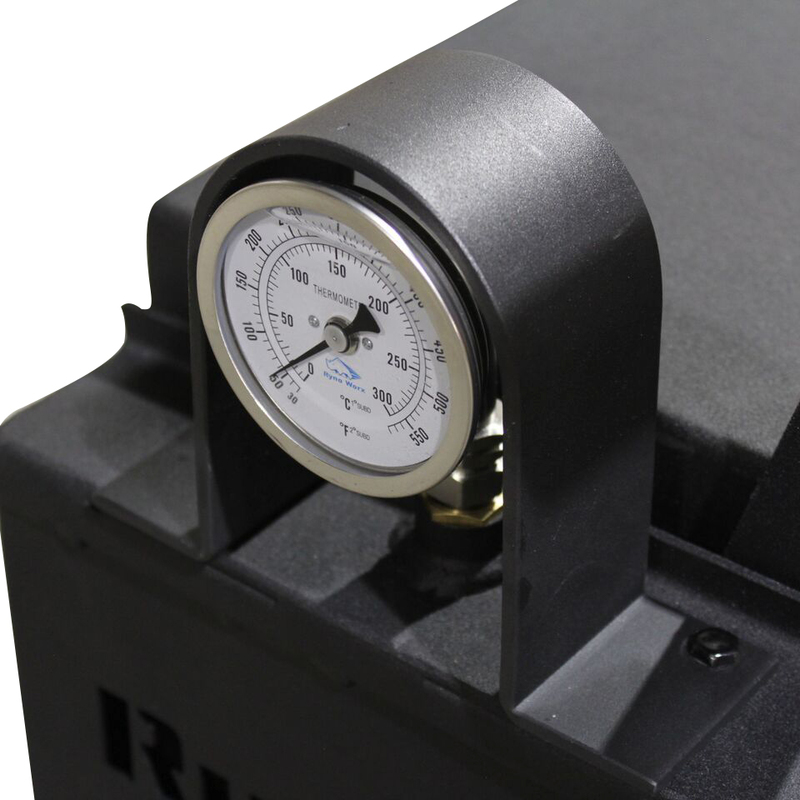 The RY10MK-PRO features a solid steel protective bracket over the gauge to protect it from accidental damage in transit. The thermometer itself is glycerin-filled to reduce vibrational damage and to provide an accurate reading even in motion. Melts crack sealant up to 50% faster than torch-fired models and allows you to melt enough filler to apply up-to 4,800ft of crack filler per day. The optimized burner/kettle design provides even heat distribution during the melting process; this eliminates downtime caused by material crystallization common to torch fired models. The sealed burner consumes nearly 50% less fuel than traditional torch-fired melter applicators.